In January 1975, an All in the Family spin-off starring the Bunkers’ next-door neighbors, the Jeffersons, premiered. Not only did The Jeffersons spend more time on the air (11 seasons) than the series that spawned it, it also reigns as the second longest-running American television series with a predominantly African-American cast (in 2012, Tyler Perry’s House of Payne surpassed it—by one episode). Here are 11 things you might not have known about the classic series, which celebrated its 40th anniversary in January. 1. GEORGE CLEANED FLOORS BEFORE HE DRY-CLEANED CLOTHES. George Jefferson was as opinionated as his former neighbor Archie Bunker, but he was also much smarter and more ambitious. When he received a $3200 insurance settlement after a car accident, he quit his job as the janitor at an apartment complex and used the cash to purchase a dry cleaning store. He eventually expanded that one outlet into a seven-store chain, which prompted his family’s move to a luxury apartment in a Manhattan high-rise. 2. THE FIRST GEORGE JEFFERSON WE MET TURNED OUT TO BE A FAKE. Producer Norman Lear had pegged Sherman Hemsley from the very beginning to play George Jefferson. However, at the time All in the Family hit the airwaves, Hemsley was co-starring in Purlie on Broadway and was reluctant to break his contract. So Lear improvised and hired Mel Stewart as a sort of placeholder. Stewart posed as George when he joined Louise for dinner at the Bunker home; it was later revealed that he was actually Henry Jefferson, George’s brother. Henry Jefferson appeared in a few more All in the Family episodes before Hemsley was able to assume his role as the Jefferson family patriarch. 3. 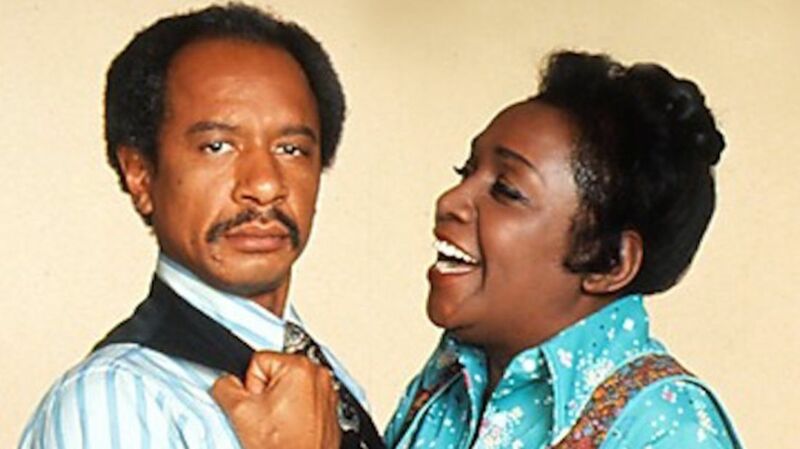 ISABEL SANFORD WASN’T INTERESTED IN A SPIN-OFF SERIES. When The Jeffersons was being pitched as a separate show, Sanford didn’t want to leave the already-successful All in the Family for an unproven series. However, casting director Jane Murray informed her that if The Jeffersons was in fact picked up, a new Louise would be cast in the role, and her character would be written out of All in the Family. 4. SANFORD WAS NONPLUSSED WHEN SHE FIRST MET THE ACTOR HIRED TO PLAY HER HUSBAND. Sanford eyed the “little man that she could squash like a bug” and wondered why the director thought anyone in the world would ever believe that the two characters would be a married couple. Of course, she was cheerfully proven wrong, because years after the show ended, she and Hemsley were often hired as a couple to appear in commercials and other TV shows. 5. HEMSLEY AND SANFORD HAD PET NAMES FOR ONE ANOTHER. Hemsley (and most of the rest of the cast) referred to Sanford as "The Queen" because of her very regal carriage and aura of authority. She wasn’t a diva, Hemsley and Marla Gibbs have stated in interviews, she was just naturally the Queen Bee. For her part, Sanford usually called Hemsley "Neck" because she thought he was scrawny (at 135 pounds) and "all neck." 6. THERE WAS A REAL "WEEZY" IN HEMSLEY’S LIFE. While growing up in Philadelphia, Hemsley had a crush on a young girl in his neighborhood named Louise, whom he nicknamed "Weezy." One day while filming an early episode he accidently addressed his TV wife as Weezy during a typical George outburst, and it became the character’s official nickname after getting the approval of both the executive producer and Sanford. 7. HARRY BENTLEY’S GLANDULAR DISORDER WAS DIAGNOSED BY AN AUDIENCE MEMBER. Paul Benedict, who played the Jeffersons' neighbor Harry Bentley, was notable for his unusual features, including an oversized nose and jaw and disproportionately large hands and feet. He’d begun to develop that way in high school, while simultaneously suffering from excruciating headaches. No doctor had been able to pin down a cause until 10 years later, in 1964, when he was co-starring in a play with the Theatre Company of Boston. An usher brought him a note from an audience member who wanted to meet with him in the lobby. The fan identified himself as a radiologist and asked Benedict if he was under the treatment of an endocrinologist, because he exhibited the symptoms of acromegaly. Benedict did see a specialist shortly after that meeting, and a 20-minute surgical procedure arrested the condition before it could cause further damage. 8. MARLA GIBBS DIDN’T QUIT HER DAY JOB ... FOR TWO YEARS. Marla Gibbs had been working as a reservation agent at United Airlines for 11 years (and acting in plays during her spare time) when she landed the role of Florence on The Jeffersons. The character wasn’t intended to be a recurring one, but Gibbs got such a positive audience response that she was called back again a few episodes later. She was eventually offered a contract, but it was for just seven episodes (at the time the Florence character had to alternate stage time with Zara “Mother Jefferson” Cully). Two years later Gibbs was still making the daily commute from the Sunset Boulevard studio after filming had wrapped on The Jeffersons to the Sixth Street United Airlines reservation office in downtown L.A. The producers were surprised when they found out; worried that she was stretching herself too thin, they suggested that she take a leave of absence from the airline. “Not unless you plan to pay me for it,” was her response. She was offered a full contract shortly afterward and said farewell to United. 9. THERE WERE TWO LIONELS. Mike Evans was the original Lionel, having appeared as the character way back on the pilot episode of All in the Family. Once the Jeffersons moved to their deluxe apartment, however, Lionel’s role was gradually reduced in order to allow George and Louise more time (and plot lines) to interact with characters like the Willises, Mother Jefferson, and Florence. So Evans found a project to occupy his time—co-creating and writing for a new sitcom (actually a Maude spin-off) called Good Times. He left The Jeffersons after season two to dedicate his energy to Good Times and Damon Evans (no relation) was brought in as Lionel for four seasons. 10. THAT’S WILLONA FROM GOOD TIMES SINGING THE THEME SONG. That booming voice belting out the lead vocals on the theme song belongs to actress Ja’net Dubois, who played neighbor Willona Woods on Good Times. She co-wrote the tune with legendary songwriter Jeff Barry (“Be My Baby,” “Then He Kissed Me”) who sang background vocals. The additional background vocals were provided by a 35-member gospel choir. 11. MR. WILLIS HAD THE LONGEST COMMUTE TO THE STUDIO. Throughout the run of The Jeffersons, Franklin Cover maintained his home in New York City, where his wife and two children lived. He flew out to Los Angeles at the beginning of the week during the filming season and stayed at an apartment while he worked. He took the bus to the studio in the mornings, but TV wife Roxie Roker dropped him off on her way home in the evenings. Then he’d fly back to New York for the weekend and start the whole process again three days later. Have you ever wondered what The Jeffersons sounded like in Italy? Wonder no more.